Summary of Content: Indenture for one-fifteenth of the share of "goods m[er]chandizes or . . . other thiungs of value" amassed by Captain Kidd and his crew of the Adventure Galley, in their privateering efforts in the Red Sea. Detailed to seek the pirates who preyed upon ships from "new England R[h]ode Island, New Yorke & Elsewhere", Kidd and his crew were promised pay only upon the capture of a pirate ship. Blackham is offered a full refund in the event that Kidd fails in his charge. Manuscript document signed, 1 page + docket. 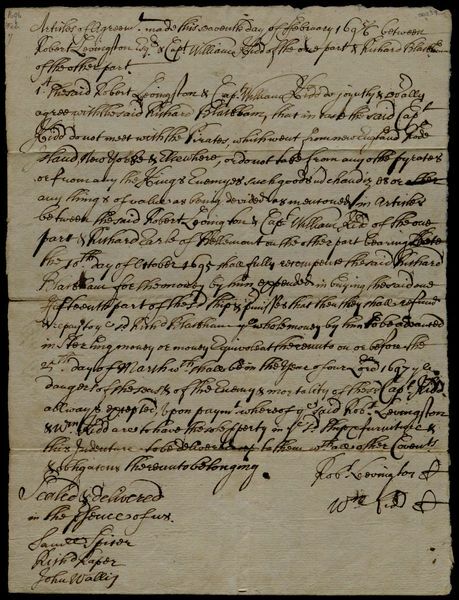 Articles of Agreemt made this seaventh day of february 1695/6 between Robert Livingston Esqr. & Capt. Williame Kidd of the one ...part & Richard Blackham of the other part. 1st. The said Robert Livingston & Capt. William Kidd do joyntly & sevally agree with the said Richard Blackham, that in case the said Capt. Kidd do not meet with the Pirates, whih went from new England Rode Island, New Yorke & Elsewhere, or do not take from any of the pyrates or from any the Kings Enemyes such goods mchandizes or [struck: other] any things of value as being devided as mentoned in Articles between the said Robert Livingston & Capt. William Kidd of the one part & Richard Earle of Bellomont on the other part bearing Date the 10th day of October 1695 shall fully recompense the said Richard Blackham for the money by him expended in buying the said one fifteenth part of the sd. Ship & pmisses that thou they shall refund & repay to ye sd. Richard Blackham ye whole money by him to be advanced in Sterling money or money Equivalent thereunto on or before the 25th day of March wth shall be in the year of our Lord 1697 ye dangers of the seas & of the Enemy & mortality of the sd. Capt. Kidd allways excepted, upon paymt whereof ye said Robt. Livingston & Wm. Kidd are to have the sole pperty in ye sd. ship & furniture & this Indenture to be delivered up to them wth all other Covents & obligations thereunto belonging.